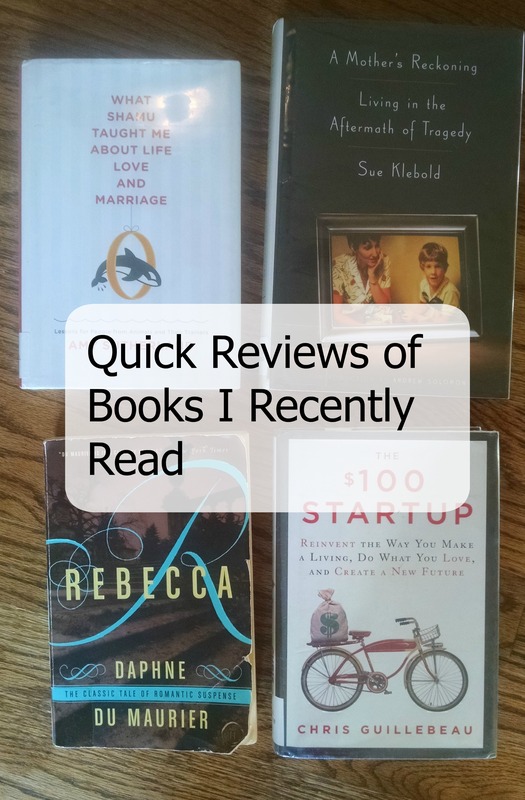 Linking up with Modern Mrs. Darcy for Quick Lit, short reviews of books recently read. I’ll start with funny and light and end with deep and serious. What Shamu Taught Me About Life, Love and Marriage – this book was cute and fun. After researching animal trainers for a story, writer Amy Sutherland became mildly obsessed with their work. She learned much from them that can be applied to our own relationships, namely that positive reinforcement is much more effective than negative. Especially where negative reinforcement isn’t an option – you can’t spank a killer whale! I’ve read an older, similar book Sutherland referred to called Don’t Shoot The Dog ! The bottom line? What you pay attention to, grows. If you rush to soothe your husband when he’s grumpy, he’ll be grumpy more often. If you listen to your next door neighbor’s gossip fest, she’ll fill your ear more often. Yes, I take pictures of words in books all the time. It saves time over writing notes. The last part reads, “don’t act like prey around a predator“. Sutherland says that when an animal seemingly “snaps” and attacks a trainer it has worked with for years, it was because the trainer let their guard down and acted like prey… even for a moment. Good advice, especially in today’s world. Despite the fact that this book had not one, not two, but THREE dried boogers in its pages (really? your sleeve wasn’t adequate? how about a good flick next time?! ), this was a good read. Chris G is a much-followed microbusiness/location independent blogger and coach. He had some great, actionable advice for us itty bitty business owners. I have seen this book recommended everywhere, and with good reason. It was gripping! I think anyone could relate to the feelings of the protagonists. As the second Mrs. de Winter, feeling the ghost of the first wife. And the pain and anger Maxim felt towards his “pretty on the outside” Rebecca. Good, good read. Sue is the mother of Dylan Klebold, one of the Columbine school shooters. We’re coming up on the 20th anniversary of the murder/suicides, and the court records will soon be released to the public. Sue answers the question everyone asked, “what kind of mother wouldn’t know her son was plotting this kind of evil?“. Anyone who doubts this only needs to look at their OWN teenage years. I mean come on, even if you weren’t up to anything immoral or criminal, did you ever make choices that would have shamed your family? Done anything you still regret? Something stupid and so unlike your adult self? Our society is so hard on parents. We elevate motherhood to nothing short of sainthood but then when a kid does something stupid, as kids will, we instantly blame mom. Most of us are doing the best we can. Who of us doesn’t know parents whose kids have made horrible choices despite being raised in love and with good values? Or maybe our own kids have made choices that left us scratching our heads? If it’s never happened to you and you don’t think it will, then your kids are still babies… so you can stay out of the conversation. I’ll talk to you in a decade. 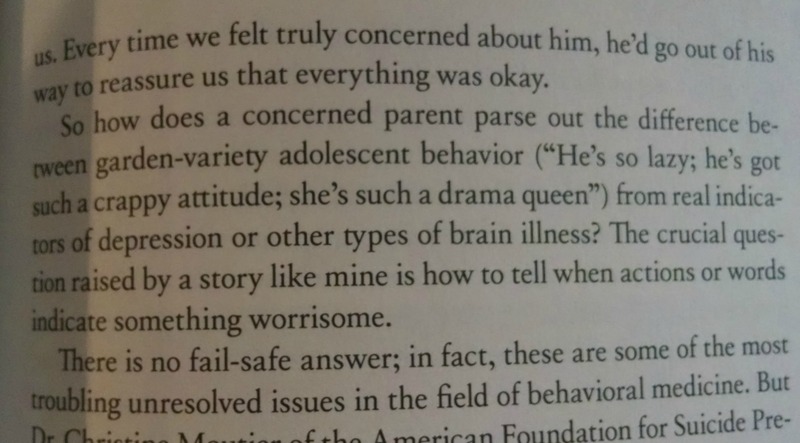 In the book, Sue points out something that everyone overlooks: that her son died, by suicide. He was deeply depressed and disturbed, something nobody knew until his diaries were found after the horrible events. This book was also a bit convicting. In the name of good parenting and wanting to offer our kids privacy (because what kind of mother reads her teen’s diary?! ), we sometimes go too far in the other direction. But still, it’s tough. Good question. 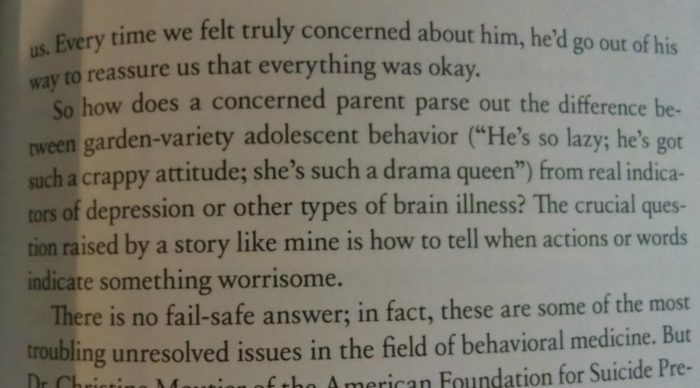 How DOES a parent “parse out the difference between garden-variety adolescent behavior from real indicators of depression?”, especially a teen child who very much wants to convince his parents he’s “not crazy“?. Even mental health experts don’t know, so how is an ordinary parent? Yep. We would like to think that these things can’t happen to us, couldn’t happen to our kids. But they can, and they do. We create psychological safety by judging. 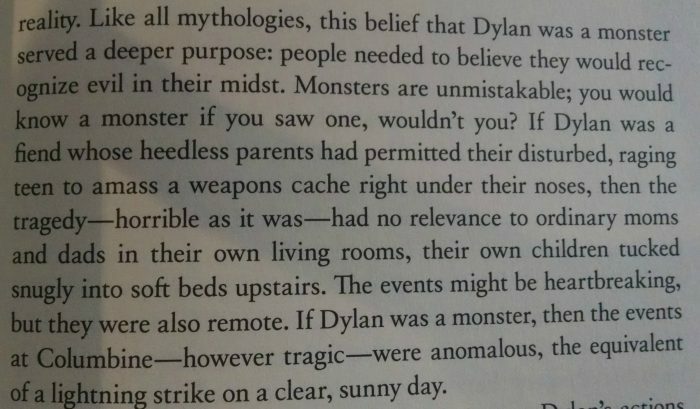 We tell ourselves that WE would know if our kids were this bad off. This book is a masterpiece and every parent of teens should read it. I love seeing what others are reading-I have a hard time finding good books to read. You’ve prompted me to reserve Rebecca and A Mother’s Reckoning at my library. Thanks! I haven’t read any du Maurier but I really want to read Rebecca before the new movie adaptation comes out later this year.